You always see, or hear, buskers just in passing, but Gloria Marcela stopped us for a few minutes. 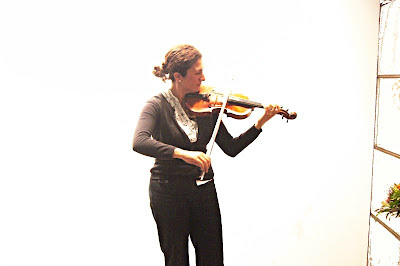 She’s a capable violinist and she was playing Bach with some ease and considerable beauty, especially give the circumstances. Actually, I’m surprised we haven’t come across more buskers in Berlin. There are enough tourists, so I’d expect more, especially given that this is such a meeting place for artists. I’ve noticed living statues more than musicians on the street. Marcela’s card says she plays a range of styles and I could believe it. She played us a mournful Columbian folk song before we left. We’re in Europe tourist mode so it’s not surprising that I preferred the Bach, but this strange city with its recent history of devastation and separation and regrowth may fit better with a lament. Gloria Marcela was busking in downtown Berlin. This was this most delicious performance to happen on. 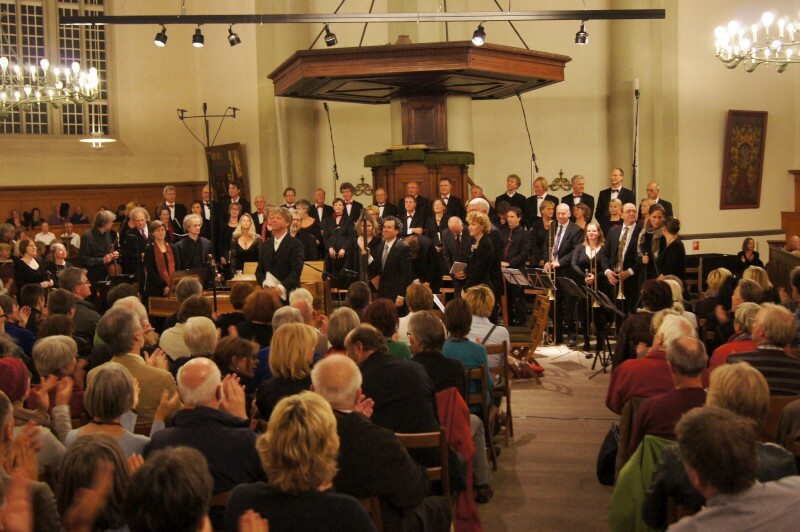 The chamber choir Apollini et Musis are members of the State Opera choir and who gather to perform a range of other musics, from renaissance through to modern. They performed in the Bode Museum, all stucco and marble and renaissance grandeur and Italian artworks including several Della Robbia ceramics. They sang a capella for some songs, or accompanied, but never overwhelmed, by a trumpet and four trombones. 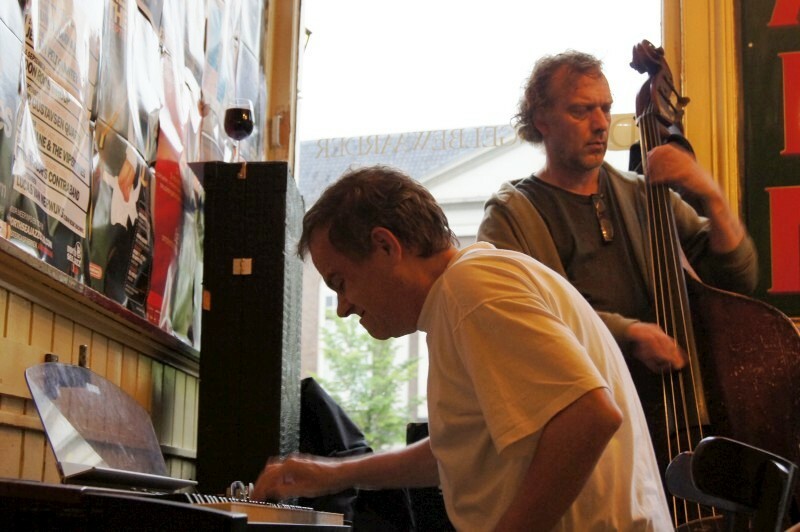 There was a drummer and improvisations on a small portable organ between tunes. The voices were drenched in echo in this hard, marble space, but when a voice, a bass or a tenor or a glorious soprano, appeared from the agglomeration, it was bliss. And these voices would rise with a phrase or vocal line and drop away to pass prominence to another. This was courtly music but it also concerned topics of mortality. First were brass, played from behind, in another room, so distant. Then an organ improv. Then the choir placed themselves and the immense melancholy of Purcell’s Music for the funeral of Queen Mary. The four trombones (or slide trumpets, which Purcell wrote for) and one drummer started from the room at the back, then moved forward to stand with the choir, eventually moving to another room behind the stage area to end. 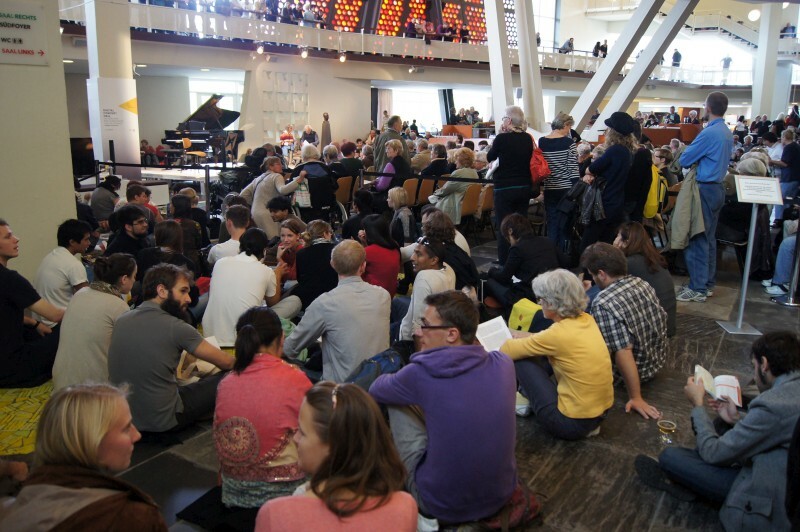 Another organ improvisation and the choir moved to an upper gallery under a reflective half-dome where they performed a series of Bruckner motets and Scarlatti’s Intellige clamorem meum. This was the most strange piece of staging I’ve seen (or couldn’t see, given angles) but I’m sure they liked the sound under that dome. Then final organ improvs and an all-in encore. Choirs certainly like echo and this certainly was an echo. I could hear bounce and remnants clearly for a good 4 seconds. A little echo does wonders to meld and enrich the voices but too much can hide detail. I felt I lost detail here, but then my ears aren’t the best. But such glorious voices and such gilded brass and such doleful and poignant music: perhaps the echo fits the poignancy. This was a stunningly beautiful and touching concert with beautiful voices and delicate brass that I would have liked to hear with more detail. Superb. 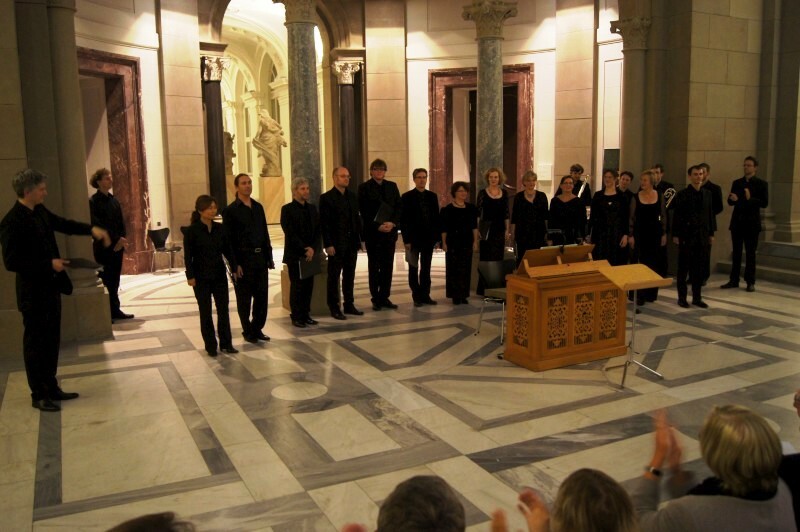 The Chamber Choir Apollini et Musis (members of Prometheus Ensemble Berlin) performed with organ, four brass and drums at the Basilica at the Bode Museum. The performers were: Frank Markowitsch (director), Haeyun Lee, Konstanze Löwe, Andrea Réti, Andrea Willert (soprano), Ulla Kraemer, Hannah Lukaschewitsch, Andrea Möller (alto), Andreas Bornemann, Martin Netter, Daniel Steiner Itenor), Simon Berg, Christoph Drescher, Thomas Neubauer (bass), Tom Pielucha (trumpet), Michael Knake (alto trombones), Carl Philipp Kaptain (tenor trombone), Peter Jaka (bass trombone), Fabian Musick (drums), Arno Schneider (organ). They performed Purcell’s Music for the funeral of Queen Mary, Bruckner motets and Scarlatti’s Intellige clamorem meum. 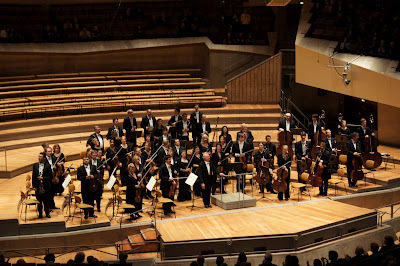 The Berlin Philharmonic was out of town on tour, but plenty of seats were available for the Rundfuk-Sinfonieorchester Berlin (Berlin Radio Symphony Orchestra - East Berlin) in the Großer Saal at the Berliner Philharmonie. It didn’t seem a challenging program (Mozart-Ravel-Mozart) but I expected we would enjoy it and we did. The hall was from the ‘60s. 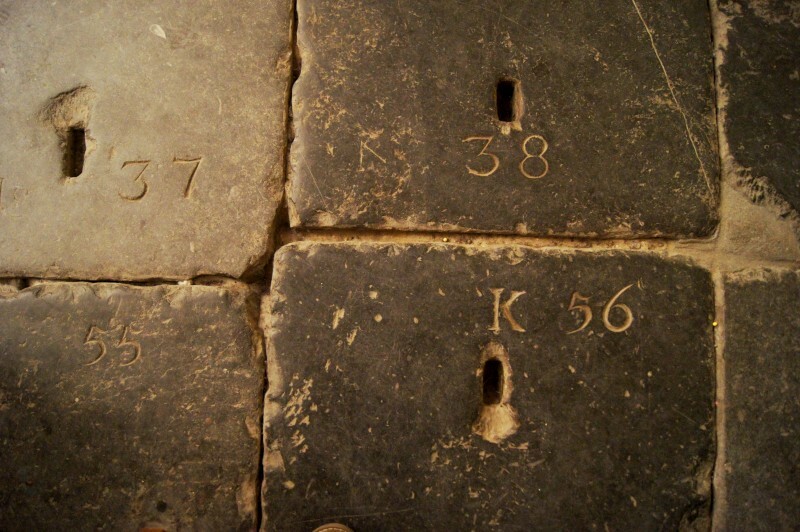 It reminded us of the Sydney Opera House, but is wider rather than long and thus the experience is more intimate. It’s got similar hanging lighting and PA and stage a generous legroom. And a hydraulic lift that had us and several other audience members fascinated in the break. This is not a large orchestra. 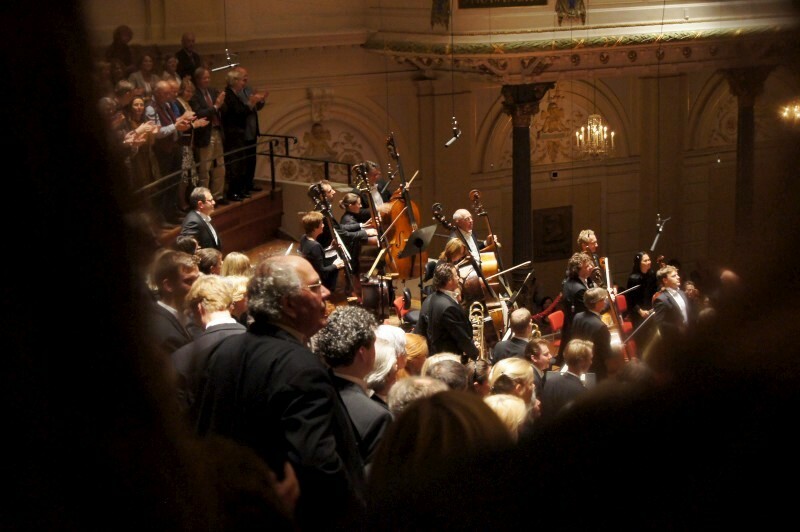 I judge orchestra size by the number of double basses (large=8; smaller=4): this had four. The first Mozart was particularly small: some clarinets, horns and bassoons in addition to strings. The Ravel required more tonal colour and added brass and harp and percussion and piano. The second Mozart was larger than the first but smaller than Ravel. Right from the first notes of the first Mozart, we were in madly attractive and well-known territory. I wouldn’t have recognised all movements of each symphony, but the first movements of each were renowned and widely recognisable. The first was Symphony No 25 in G minor KV183. Apparently this is a Sturm und Drang style, a “proto-Romantic movement in German literature and music taking place from the late 1760s through the early 1780s, in which … subjectivity and … emotion were given free expression in reaction to the perceived constraints of rationalism imposed by the Enlightenment” (Wikipedia). The musical implications are wide melodic leaps, sycopations, bursts of wind instruments and the minor key. I found the performance was nicely steady with stately tempo and strong dynamics. The Ravel was his Piano Concerto in G major and was a different beast. It started with jazz-like lines on piccolo then a devilish snap into trumpet then piano backing a Gershwin melody on oboe to open this jazzy work. Megan and I immediately thought of Gershwin and Rhapsody in blue. Apparently Ravel had recently toured the US and was keen on jazz syncopations and harmonies. Then on to three movements with sudden changes, string pads, jazz-folk harmonies, a few humourous trombone slides and story-telling variations. This is delightful jazz-age fusion. Pianist Kirill Gerstein played an encore solo piece and then the interval. We hung around with a batch of fellow tech-obsessed audience to watch the hydraulic lift take away the piano, then Mozart again with another eminently renowned theme, this time his Symphony No 40 in G minor KV550. I now learn that Mozart only wrote two symphonies in G minor and we heard them both this evening: the Little G Minor symphony (No 25) and the Great G Minor symphony (No 40). The Great is a work in four movements and scored for more instruments that the Little. I noted the first movements as insistent and could hear Beethoven in rolling, falling phrases. The second movement was a minuet in 6/8 with some darker complexion at times, querying and imploring. Wikipedia notes the use of hemiola: I felt quite uncomfortable this with this passage. The third movement is stately, bold 3/4 with unexpected changes and some interesting passages of odd lengths. 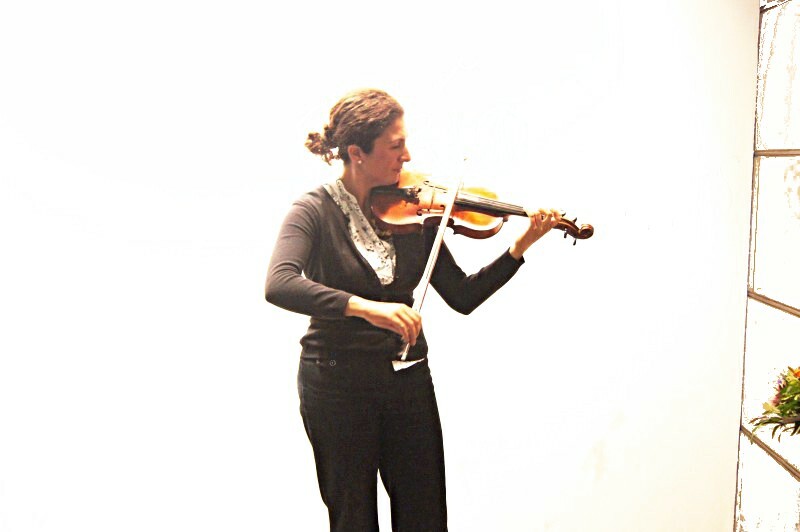 The final movement was common time with sheets of 16th notes and an odd, open connecting fill in the middle. So, an informative and entertaining pairing of Mozart symphonies and a jazz-age Ravel. Very well enjoyed. 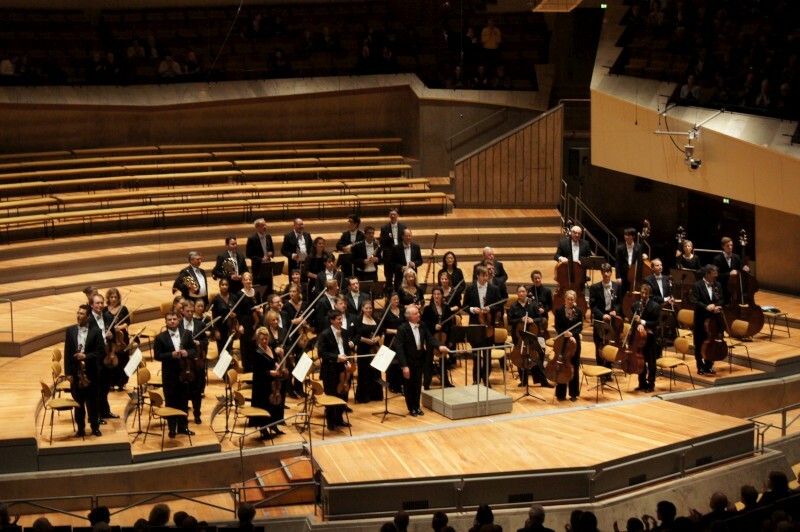 The Rundfunk-Sinfonieorchester Berlin was conducted by Marek Janowski in the Großer Saal at the Berliner Philharmonie. They performed Mozart’s Symphony No 25 in G minor KV183 and his Symphony No 40 in G minor, KV550 and Ravel’s Piano Concerto in G major with pianist Kirill Gerstein. It’s confusing in a new town when you look for gigs. You have no idea what’s interesting or who to see. Luckily I crossed Reuben’s path and he pointed me to A-Trane this night. After checking out the website, it’s obvious that A-Trane is a significant club. It seems this is one on the touring circuit. So coming up in the next few weeks are Al Foster and James Blood Ulmer. 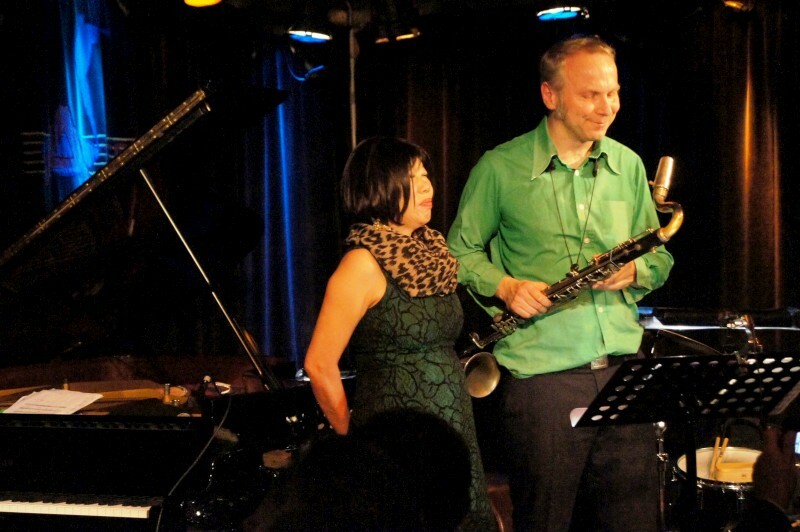 First set was by the duo of Japanese pianist Aki Takase and bass clarinetist Rudy Mahall. Now, I know the reputation of the bass clarinet as a difficult instrument and I had no idea of Aki T as a pianist, so I had no idea of what to expect. I got a fascinating and challenging outing with some pretty extreme, free explorations and wonderful technique. 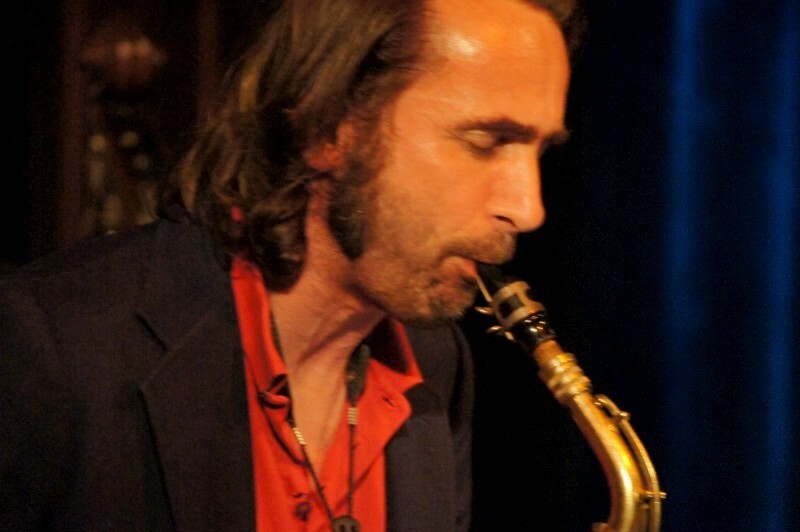 Rudy played the bass clarinet like the easiest of saxes running scales and arpeggios at speed and playing with all manner of harmonies and with the most chipper presentation. A joyful touch is not something you expect from the experimental scene. Chris suggested it’s a background out of cabaret. 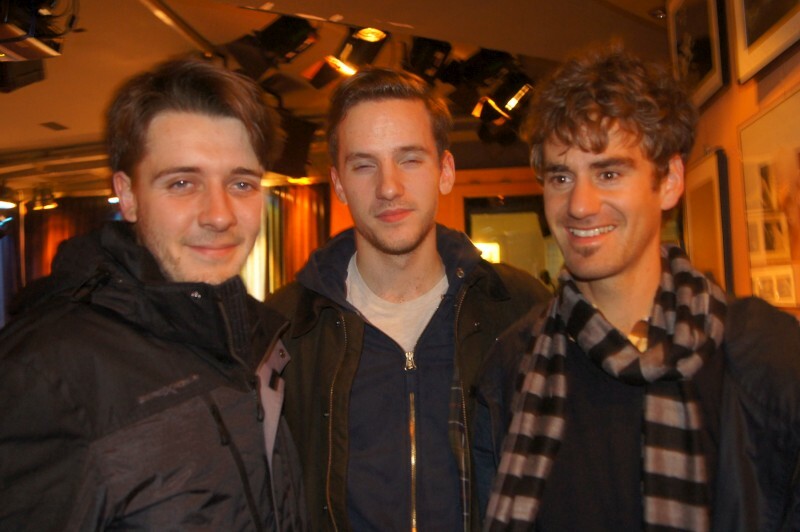 I have no idea, but it’s definitely attractive and endearing. As for Aki on piano, she was a place shaker to my ears. Sometimes swing or stride, othertimes the most brave and confronting dissonance. Ati can play some seriously intriguing music. 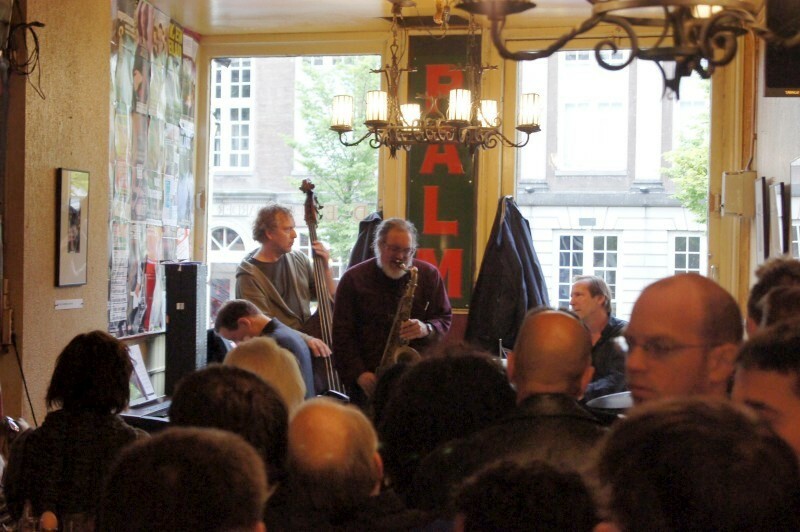 They played a few Ellington tunes and some originals and Eric Dolphy and I think one Monk piece. They even played Take the A-Train, or was it their take renamed as U-Train (I missed most of the patter, given no German)? I didn’t hear the link to A-Train, but I guess it’s there. This was ecstatic and energetic and barrier-breaking music that was played with immense skills with confidence and appeal. 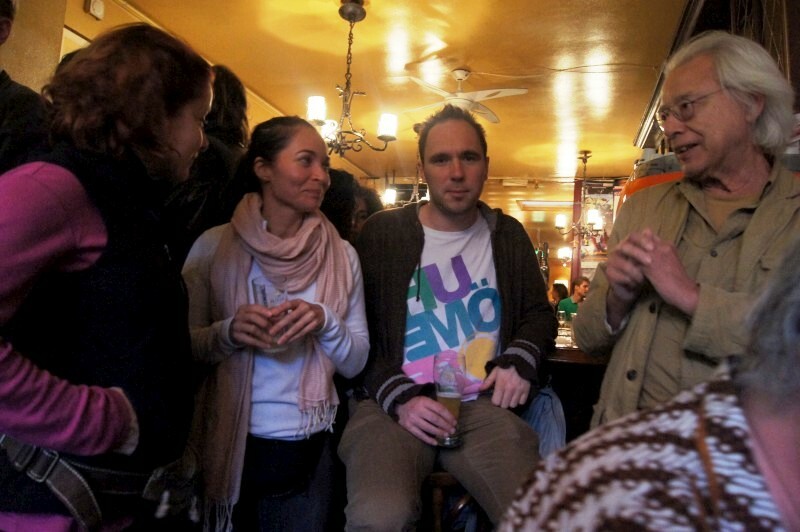 I was intrigued and absorbed, when I wasn’t taking a rest from the demands of it all, for a sip of beer. 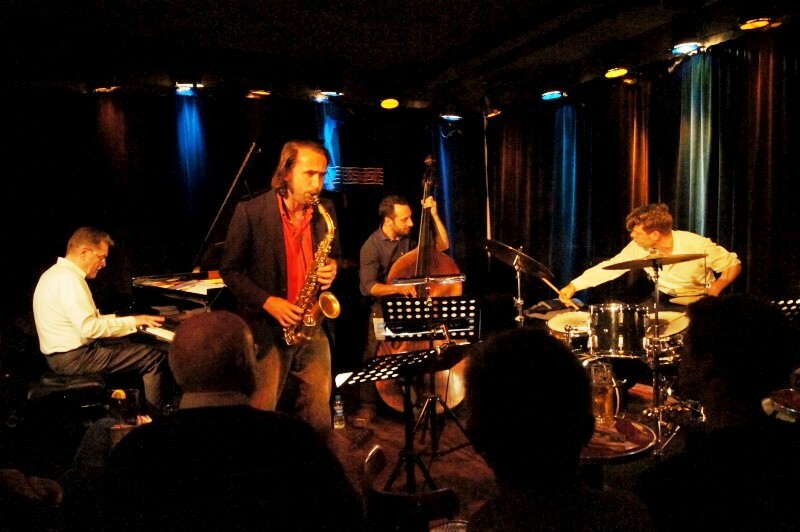 Second set at the A-Trane was the Schlippenbach-Walsdorff Quartet. 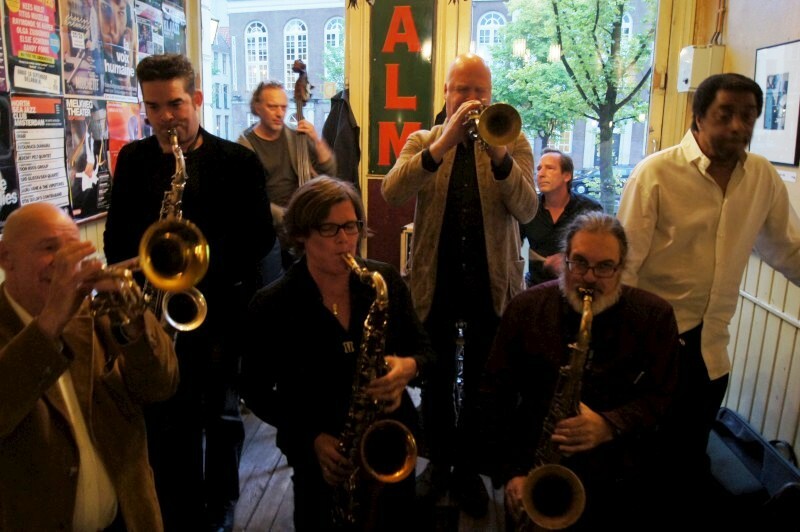 Reuben had told me AvS is a significant name in the Berlin jazz scene and this is no understatement. He’s recorded profusely and led several large ensembles (Globe Unity Orchestra and the Berlin Contemporary Jazz Orchestra) and recorded a Monk “complete” works for one night). So this was an interesting, local experience. 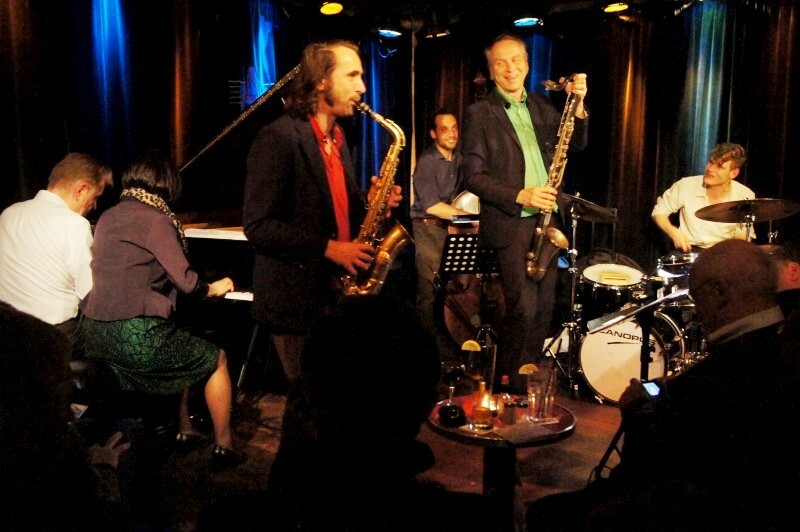 I heard this gig as in the style of the Jazz Messengers, so I wonder if he also plays this role in Berlin. Certainly, the music was similar. Hard bop, hard swings, played hard; head/solos/head, common structures, eg 32-bars. I didn’t feel the band gelled early on, but they were sitting nicely by the end. 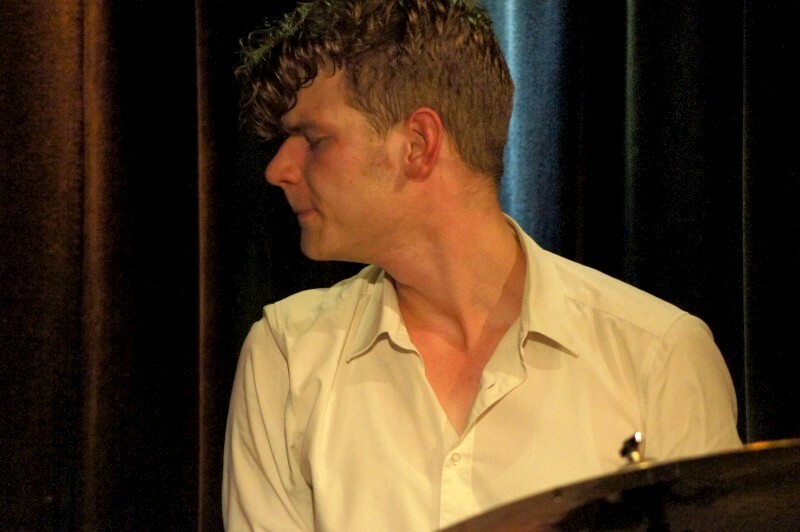 I heard Christian’s drums as immensely confident and forceful and youthful from the top: perhaps a rebel with a cause. 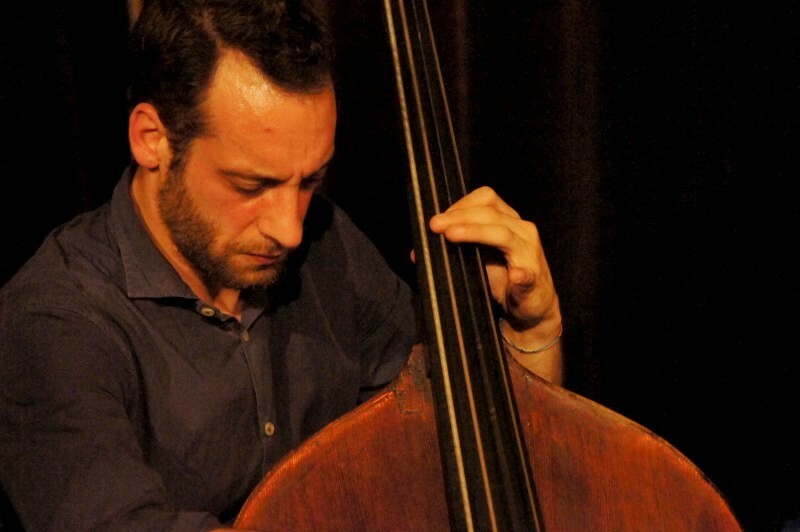 Antonio’s bass was initially more reticent, but he strengthened and I particularly liked some later solos which were understated but clear and purposeful. 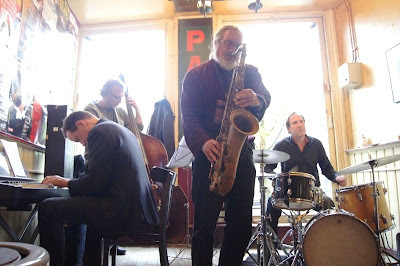 The two others were doggedly behind the beat, especially early in the night, Alexander playing busy eighth-note lines and Henrik more sparse with a light staccato. I particularly liked some contorted melodies and unresolved endings and AvS is renowned also as a composer, so I guess they were his. The night ended with the two bands together for an encore. And as I write this, I learn that it was husband and wife together on the piano stool and that Rudy Mahall has featured I recordings by AvS. So this is local jazz aristocracy. Impressive. 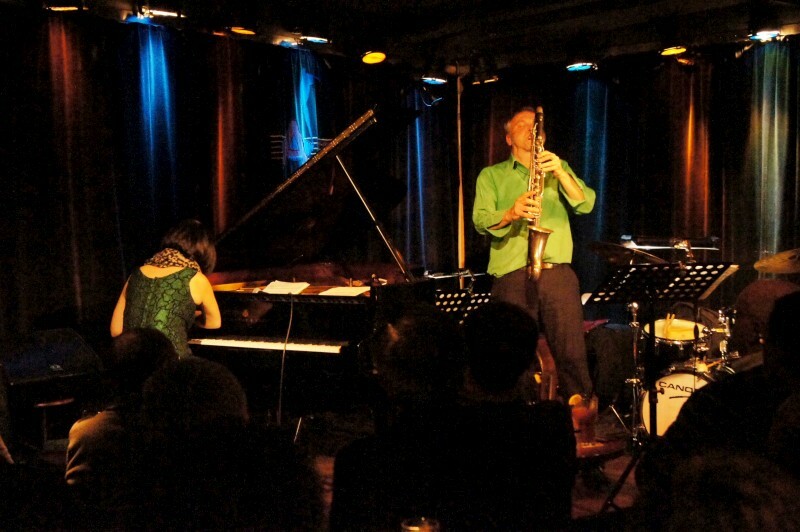 Aki Takase (piano) and Rudy Mahall (bass clarinet) played the first set at the A-Trane club in Berlin. 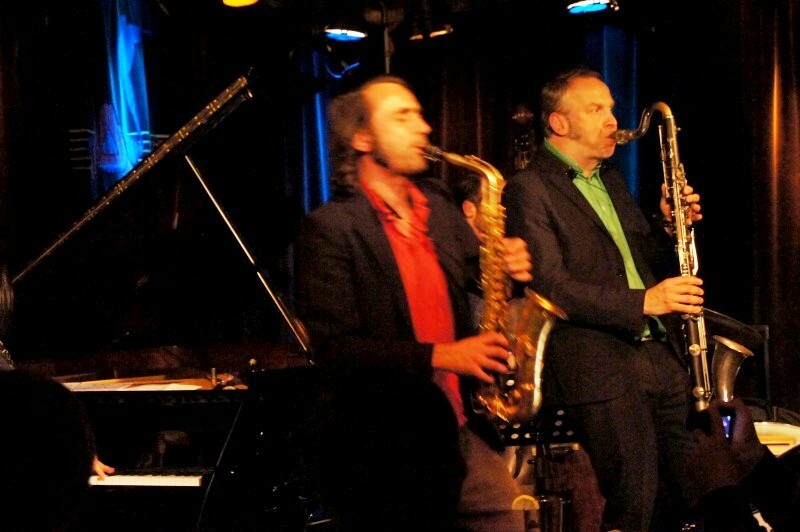 The Schlippenbach-Walsdorff Quartett featured Alexander von Schlippenbach (piano), Henrik Walsdorff (alto), Antonio Borghini (bass) and Christian Lillinger (drums) played the second set. They all played the encore. 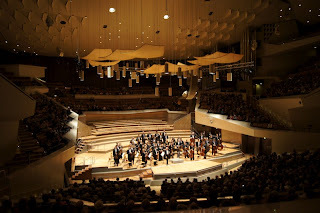 Tickets for the Berlin Philharmonic here in Berlin are not nearly as difficult as I’d expected. 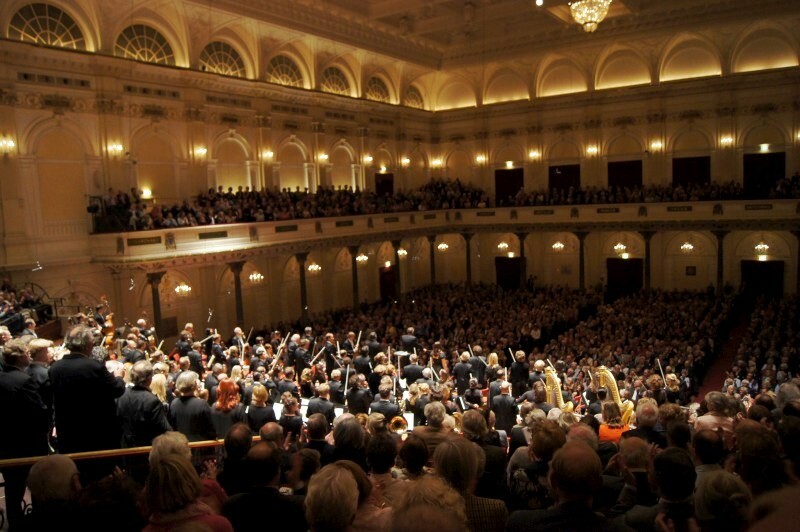 If we were here another week we could be hearing them in their home concert hall playing Beethoven (for this read popular) and Wagner under Haitink. Sadly they are on tour this week. A free lunchtime concert was the fall back. 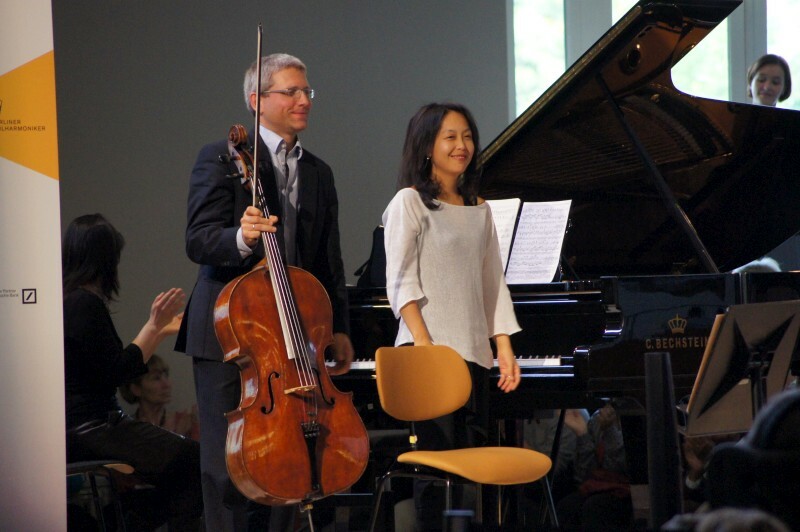 Nikolaus Römisch played cello and Kyoko Hosono played piano in Sergei Rachmaninov’s Sonata for cello and piano in G minor. This is a popular event! They counted entries by giving you a token on entry that you promptly dropped in a box. I’m told there were 1,500. I could believe it. 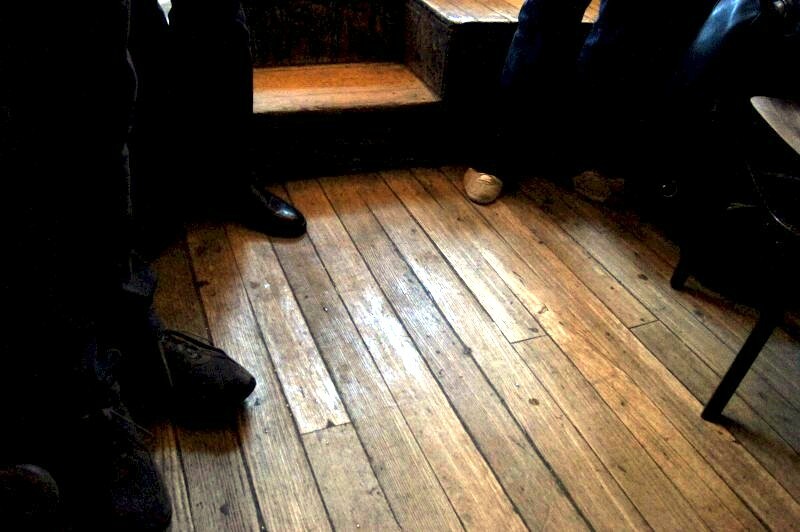 They were sitting on steps, on the floor, arrayed over balconies, standing, even walking around discretely. Some were eve seated. It’s not the best environment for a classical work, but it was fairly well respected and we enjoyed it. Certainly the price was right. This is a work in 4 movements in G minor, variously modulating from 3 to 4 flats and ending with the last movement in one sharp, G major. The time signature also moved around over the movements. I got a triplet feel of 12/8 as the most prominent, but there were passages in 3/4, 4/4 ad 3/2 . Apparently Rachmaninov disliked it being called a cello sonata due to the equality of the two parts, and both Megan and I noticed the way melodies would pass between the instruments. I was noticing the rich capabilities of piano as it rippled and variously supported a cello line, but then cello also provided arpeggiated backings at other times. Nice to have heard at least one concert at the Berlin Phil and a noble presentation it was. Just not so involving as a seat in a quiet hall with 120 musos blasting away. And also nice to feel the village atmosphere that Berlin is renowned for. I hadn’t believed this description, given its population of ~3.5 million, but then I ran into Reuben Lewis and Ronny Farella in the audience. It’s a small world after all. Nikolaus Römisch (cello), Kyoko Hosono (piano) performed Sergei Rachmaninov’s Sonata for cello and piano in G minor as a lunchtime concert in the foyer of the Berlin Philharmonie. Nothing laid back about this jam session. Dirk had said to go and it was a great recommendation. It’s been going on for yonks (was it 15 or 25 years? ), it’s hot and sweaty and take no prisoners, it’s a fight to get to the bar or even to get in the door. But the beers are good. Dirk says there are tons of best Belgian beers on tap and I had one but couldn’t see enough of the bar to check how many others there were. The tunes were all the old Real Book standards, of course, but chosen for excitement and played for speed and abandon. These were top level players. There were some great solos and a milling of mates between tunes. Lots of horns, a few pianists, just one bass and drummer. 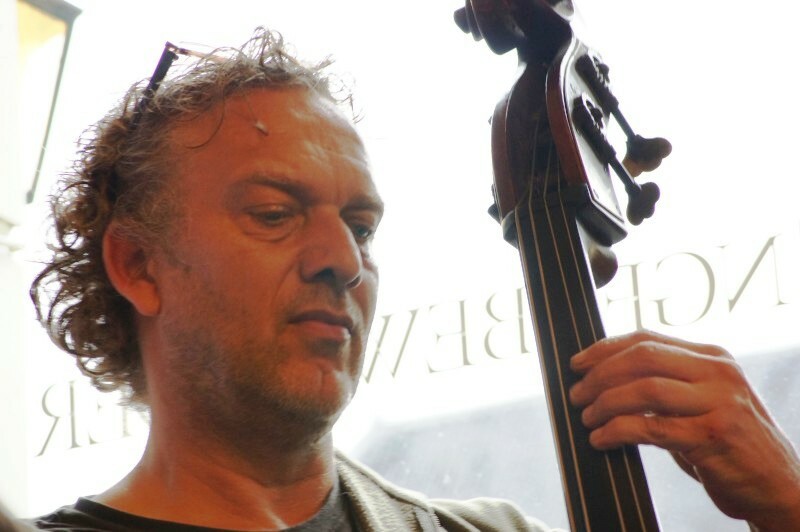 I got the name of the bassist and will try to find out other names, but he was wonderful: Jacko Schoonderwoerd. He’s the right age so I guess Jacko is a tribute to Jaco and a comment on his chops. He was on acoustic bass, with chops a-plenty and interesting lines. 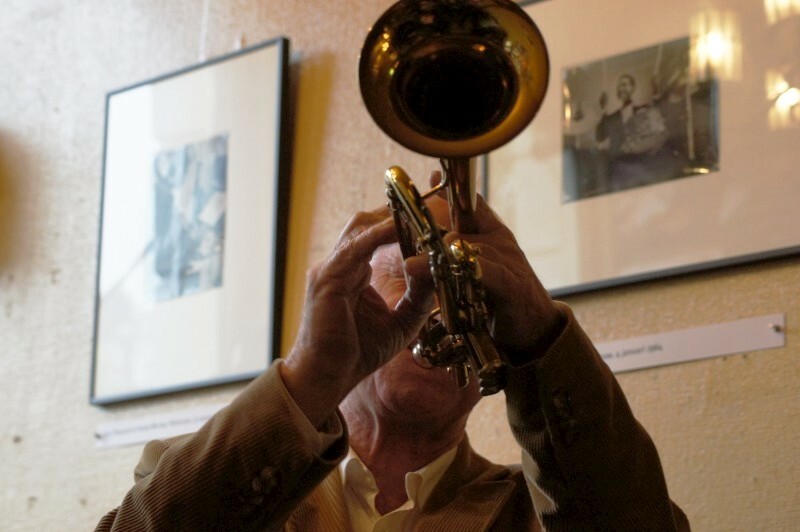 There were plenty of modern harmonies and substitutions and flourishes from pianos and horns and just a touch of the older styles were evident from occasional more venerable gentlemen, but always with that jazz vivacity. 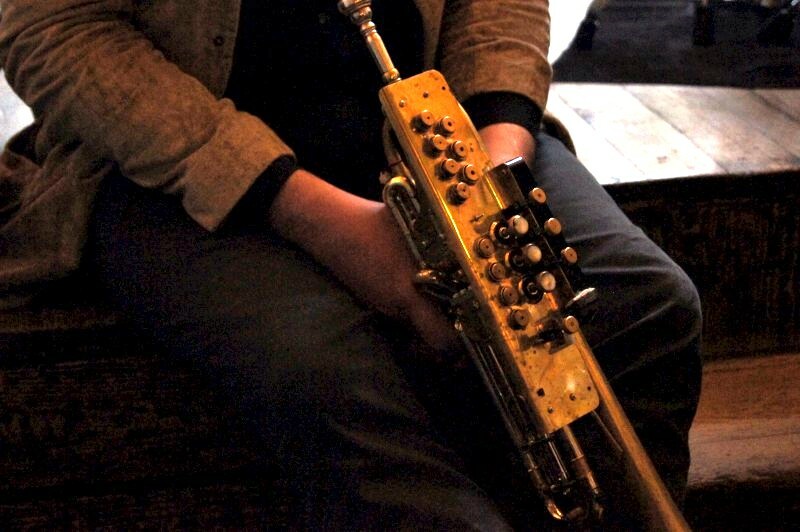 There was one home-experimentation-test-bed of a trumpet with a panel of buttons and additional valves. Someone said it’s electronic and mentioned echo. In this contest he just played the standard three valves, and he was certainly no slouch either. 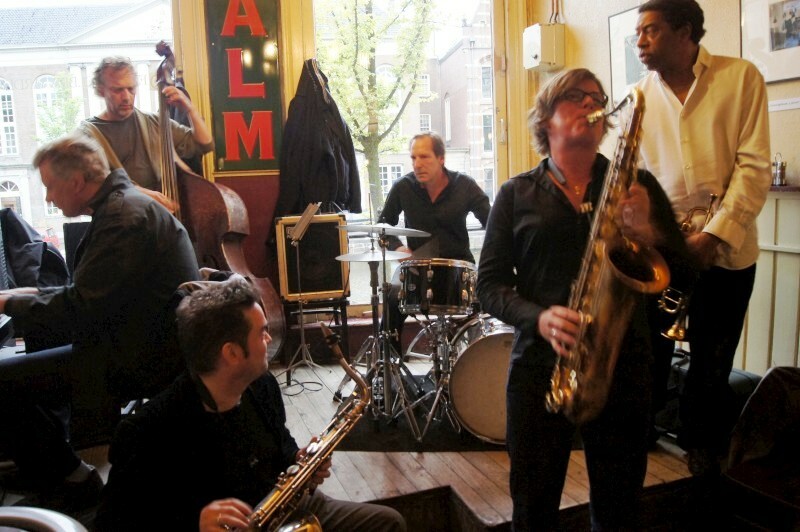 Nice and noisy and central and not one to miss from 5pm on Sunday evenings at the literary Café de Engelbewaarder (translates as the Guardian Angel Café) on the Kloveneersburgwaal, near the Zeedijk (red light district) in Amsterdam. 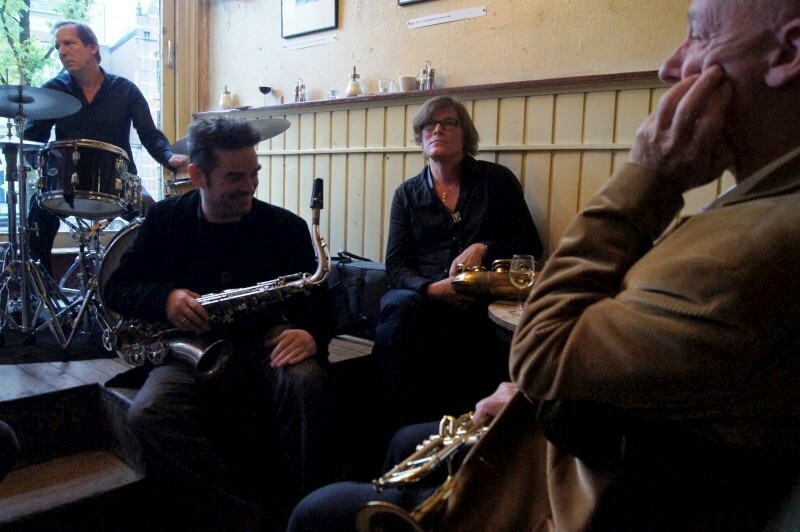 The originators and hosts are Jacko Schoonderwoerd (bass), Victor de Boo (drums) and Sean Bergin (tenor). 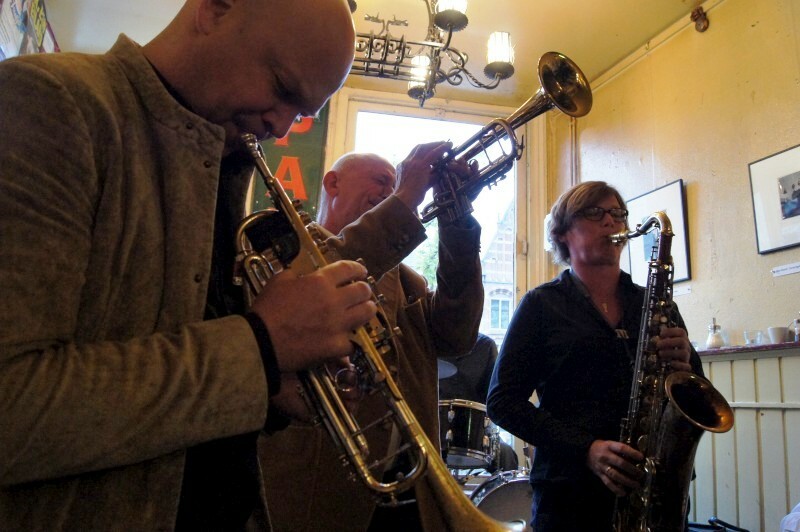 Also Hans Leeuw (experimental trumpet), Robert Rook (piano). Emma commented before we left that we were going to party towns: Amsterdam and Berlin. Certainly, there’s a visiting population that parties in Amsterdam: young, stoned, sexed up. 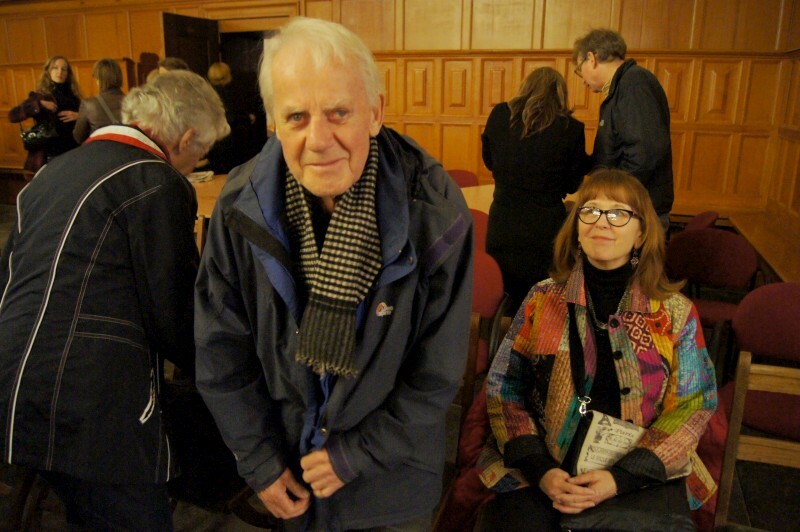 But I’ve also seen a liveliness and joy in living in the older locals. 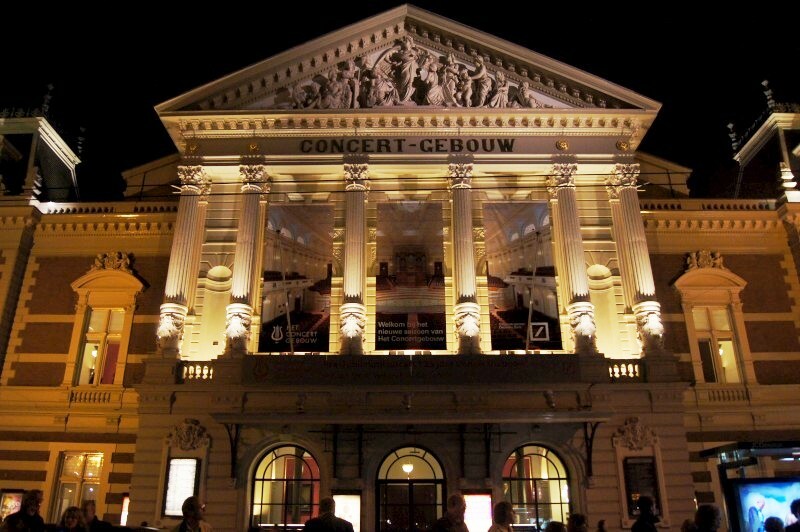 It’s strange to say this about the Concertgebouw but even stranger to say it about a concert at an austere Protestant church. Maybe it was the music, which was Monteverdi and Catholic or maybe it was the generous interval during a long work, but there was much congenial pleasure in the unrestrained chatter better the two sets. 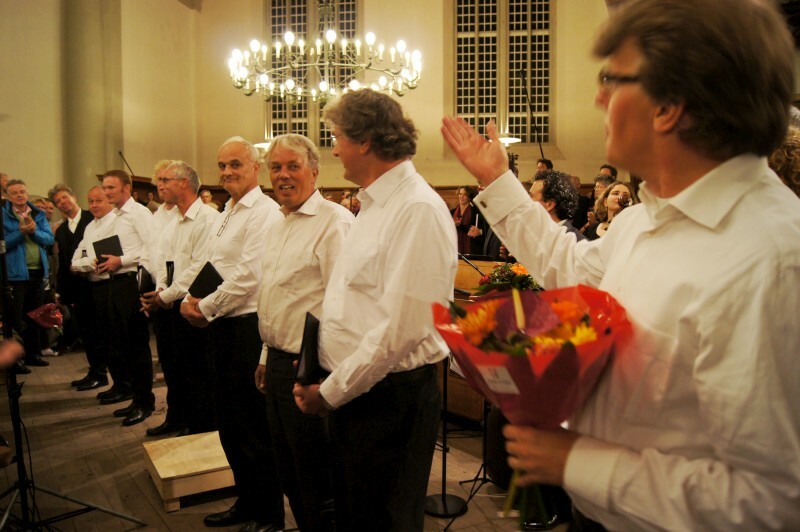 We went to the Noorderkerk to hear the Amsterdamse Contorij and their Barokorkest, the Scuola Cantorum Amsterdam (singing Gregorian chant) and six singers perform Monteverdi’s Maria Vespers (Vespro della Beata Virgine). It’s a long work (~90mins) and it was performed with an interval. It sounds courtly and stately and features plainchant as a cantus firmus. It’s a new concept to me, but this cantus firmus chant states the themes for further development. The choir required for the Vespers is large as it must sing up to 10 vocal parts, split into two choirs and support seven voices (here 6 soloists). The chant and the solo voices sounded at home in this immensely echoey space. The voices seemed to grow as they held notes, then died away with waves of echo. What’s lovely for voice can be a mush for instruments or more complex parts and I did find it hard to follow individual lines when the musicians and singing were in full flight. But how they could fill such a space! Courtly and restrained sometimes, but also magnificent and blissfully forthright at others. 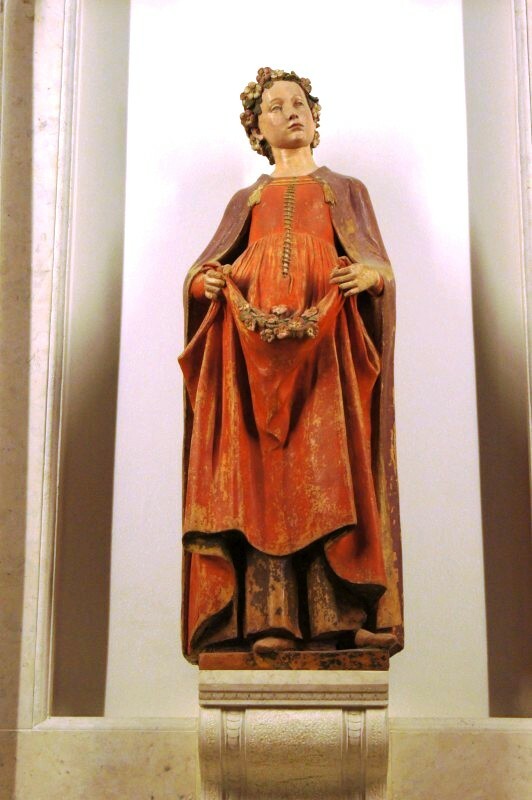 Magnificent is an apt word for the baroque Catholic world and also fits this work given it features a Magnificat. The program gives a nice introduction to the work. “The Marian Vespers are structured according to the tradition of vespers as used in monastic liturgy, containing five psalms. These psalms, however, are monumental in scale and all combined with a so-called Concerto, written for soloists and instruments. 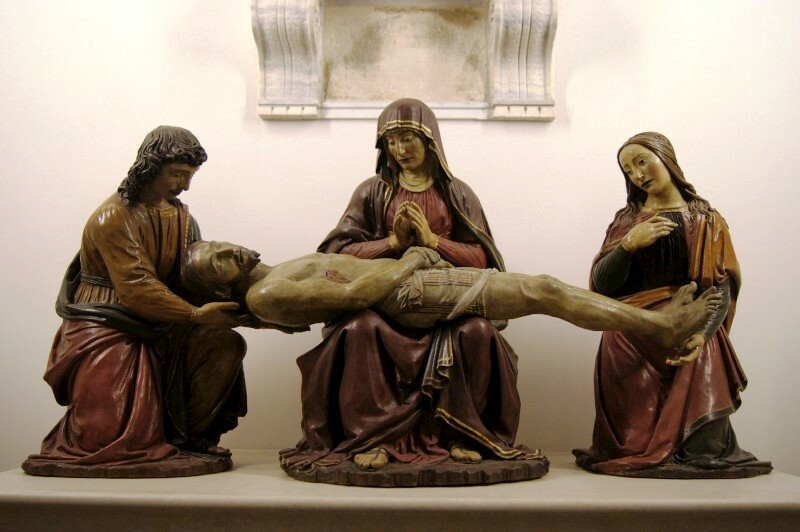 The psalms are followed by one of the most remarkable movements: a Sonata to the litany ‘Sancta Maria, ora pro nobis’, an elaborate instrumental movement, with the Gregorian litany sung by the sopranos. After the Hymn ‘Ave Maris Stella’ the Vespers are concluded with the monumental Magnificat, like all other movements set to the original Gregorian cantus firmus.” (http://www.amsterdamsecantorij.nl/concerten_archief.php, viewed 23 Sep 2012) The orchestra appeared to be using period instruments. Certainly, there was a viola da gamba, a small boxed organ, a harpsichord, a thorbo (a bass lute with a 1.5m extension) and a row of trombones including at least one with two bells. 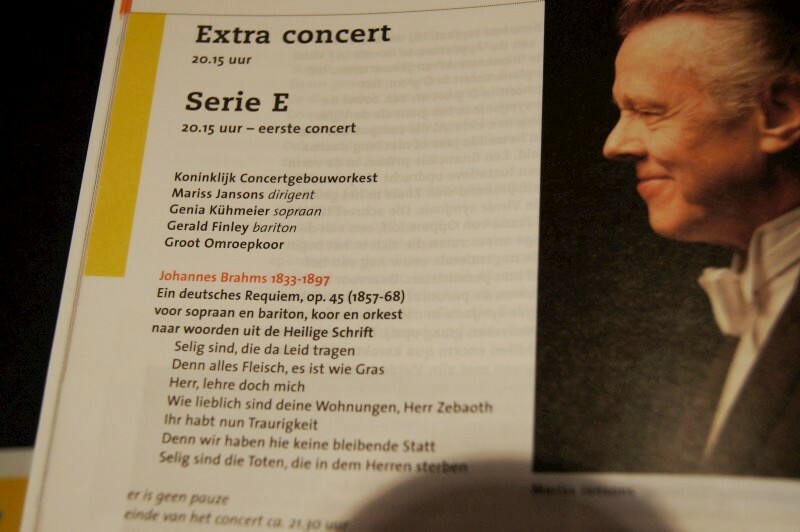 This was another magnificent musical outing on Euro soil performed for a local and knowing audience. As we set off, and as the audience mounted their bikes and departed in waves for the ride home, we mused on the good humour and conviviality in a profound musical setting. We were the unexpected tourist ring-ins at this event and loved it. 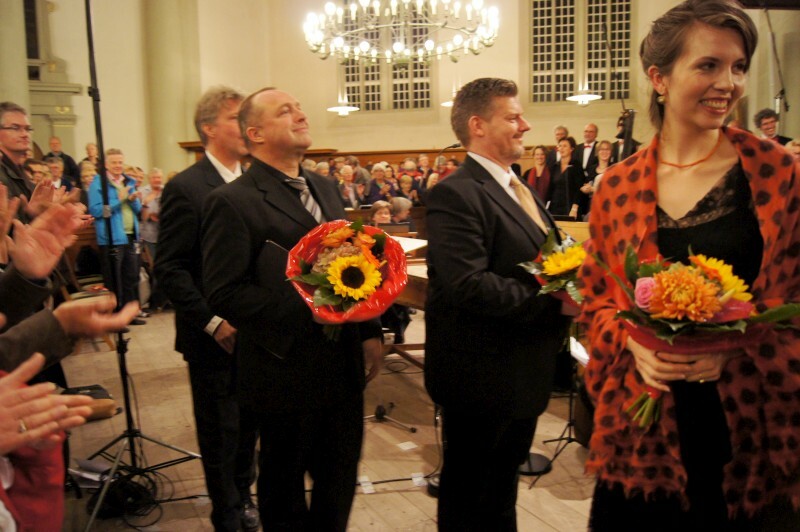 Claudio Monteverdi’s Maria Vespers (Vespro della Beata Virgine) was performed by the Amsterdamse Contorij and their Barokorkest, the the Scuola Cantorum Amsterdam under Marcel Ziljstra, and singers Marjon Strijk (soprano), Merel Kriegsman (soprano), Marcel Beekman (tenor), Harry van Berne (tenor), Jelle Draijer (bass) and Matthijs Mesdag (bass). 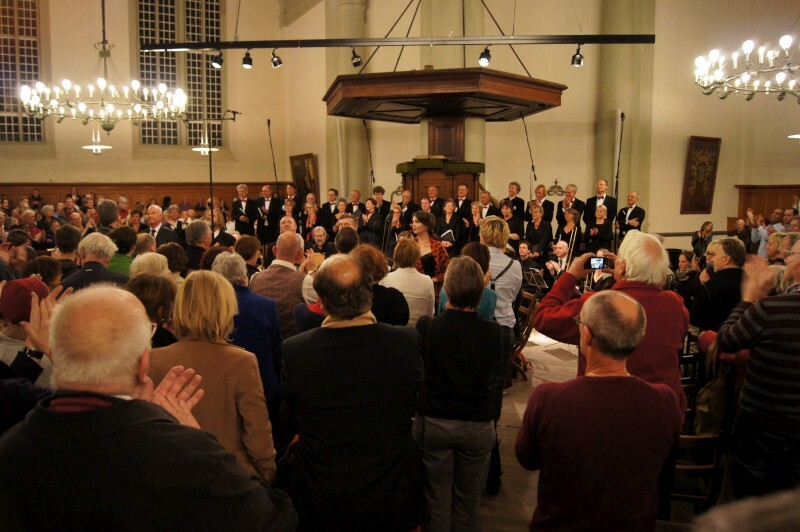 Felix van den Hombergh conducted. It would (almost) have you believing in fate. 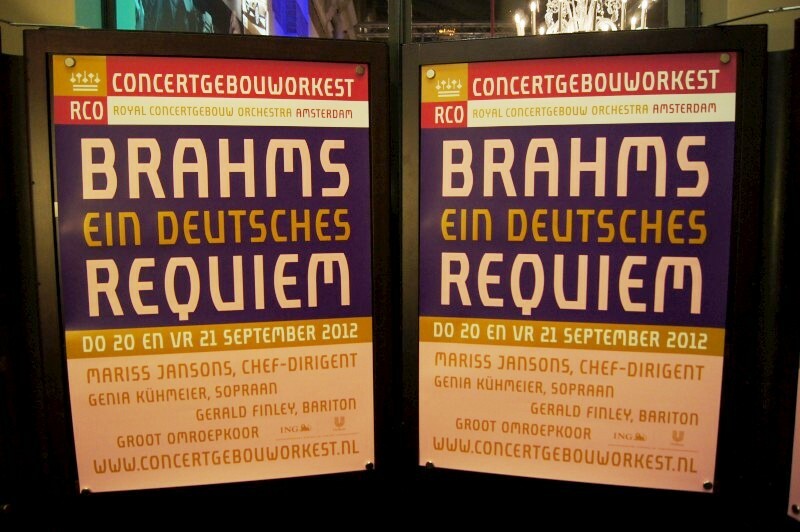 Megan and I heard Brahms’ German Requiem at the Amsterdam Concertgebouw last night. 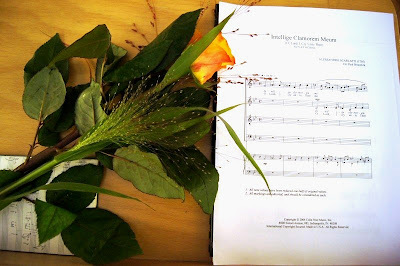 We had been unable to attend Igitur nos’ performance of this work just two weeks before in Canberra (Latins sing German, CJBlog, 10 Sep 2012), but here it was being performed in one of the great concert halls of the world when we are in town. Tickets weren’t available on the Net but we were advised to try the box office, and sure enough there were a few remnant seats. They were not the best: last row, behind and above the choir. Maybe the location gave the space its sound. We may have been in a bass trap corner. My first impression? The sound was anything but clinical. The eight double basses were deep and overwhelmingly obvious and the orchestra was not distinct. This was richly involving sound but not at all clinical or accurate, at least not where we sat. 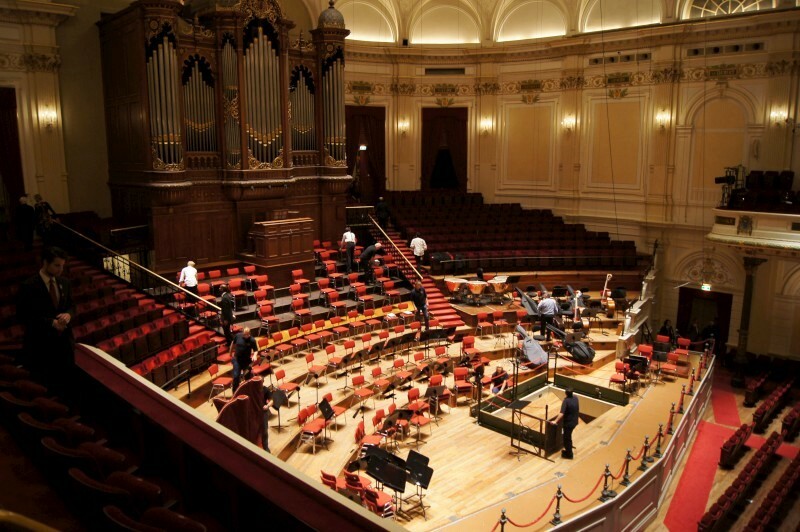 Perhaps that’s the nature of these older concert halls that predate modern acoustics. Certainly, this generous reverberation is valued by choirs. Sitting at the rear also changed the balance of voices and orchestra. The projected voices, the choir and baritone and soprano, were relatively quiet and almost lost at times. But in the quiet passages, how perfect were these voices. 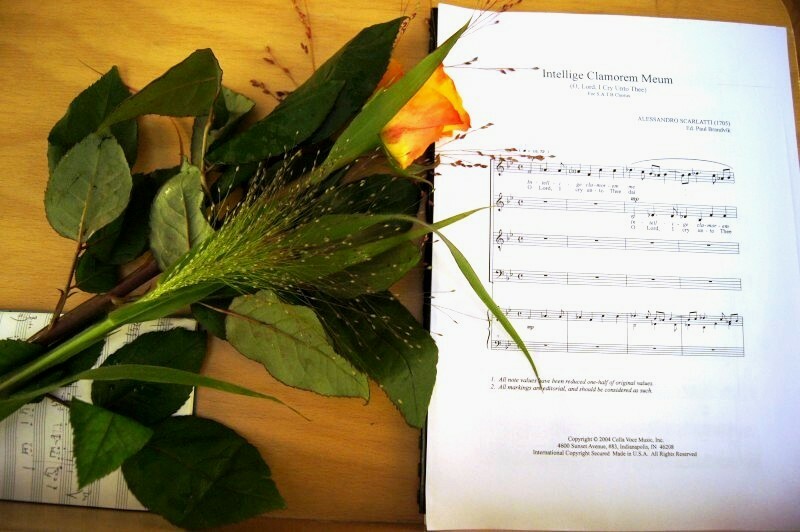 Such easy and accurate voicings; such clear and pure interplay of vocal parts. Some Igitur nos sopranos jokingly complained of high notes when I heard a rehearsal for this work. This choir just cut it: no strain or struggle at all. Several times a high note started a passage and every time it was just there. How good must these singers be? And the musicians were no slouches. Or maybe they were (but in the best way). I had a feeling of ease about this whole performance: no rush, no fluster, a daily outing. I don’t know how quickly this was conducted, but it always felt slow. I first noticed when the final note of a movement sat long, long, long.. What indulgence is this? It sat … and sat. Not one time but several. This is emotions wrung from the piece. It could so easily drop into immoderation, but it didn’t. It felt true although perhaps with some heart on the shoulder. But still, not tacky. I wonder if European music halls are like this. Big generalisation, I know, but these people live with it. It’s embedded in their culture. 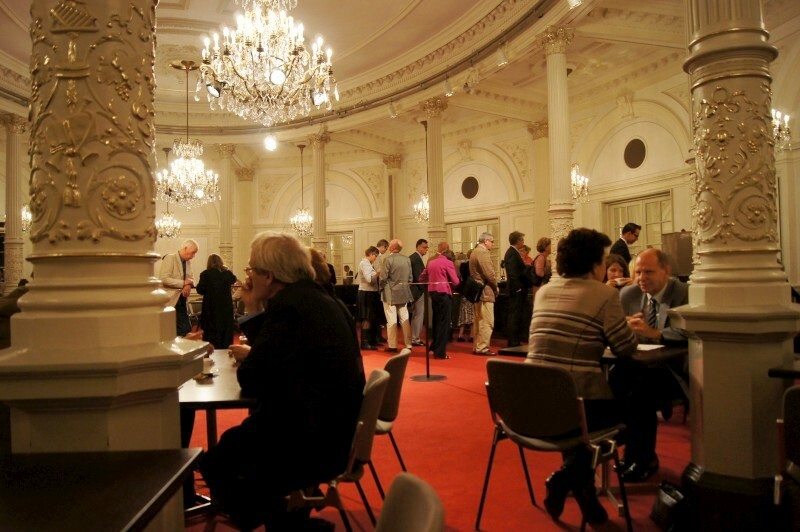 Just the feel of the Concertgebouw experience was like this, like an easy outing to the local hall. Your ticket covers free public transport for the evening. 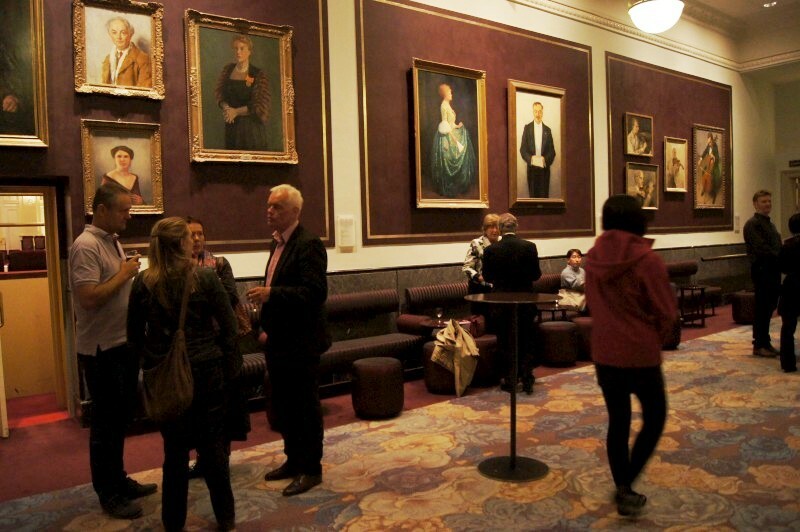 There are free coffees and wines and beers before and after the performance. 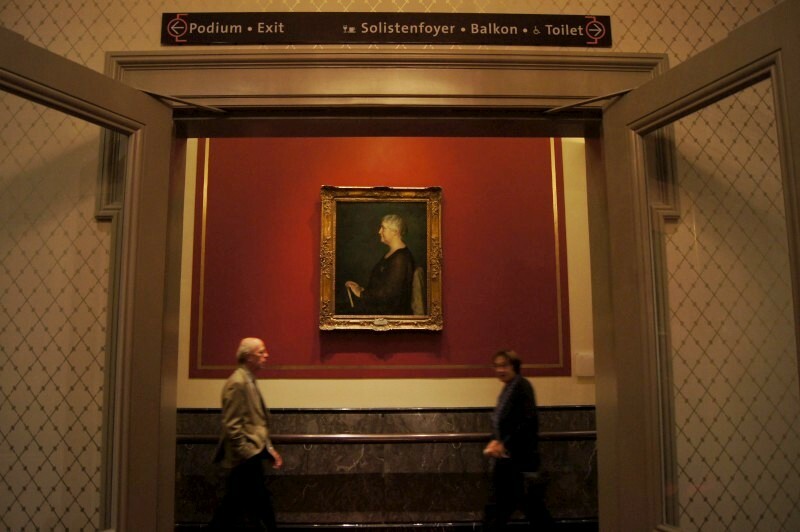 The public spaces have rococo decoration and paintings and busts of famed conductors and sopranos and cellists, but the tables and chairs are from the local cafeteria. 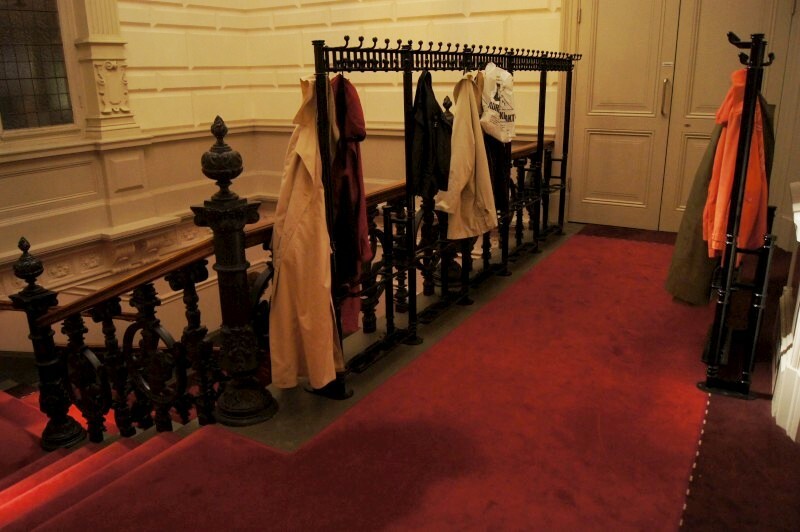 But the best: there’s a cloakroom, but also racks at the top of the stairs overflowing with rows of coats left by their owners. The standing ovation at the end includes a surge down the aisles. The bell-curved coughing between movements is the one downside I noticed of this attractive mix of expectation and easy informality. And finally, there’s an expectation at the start, with audience taking their seats and orchestra in place busily warming up. 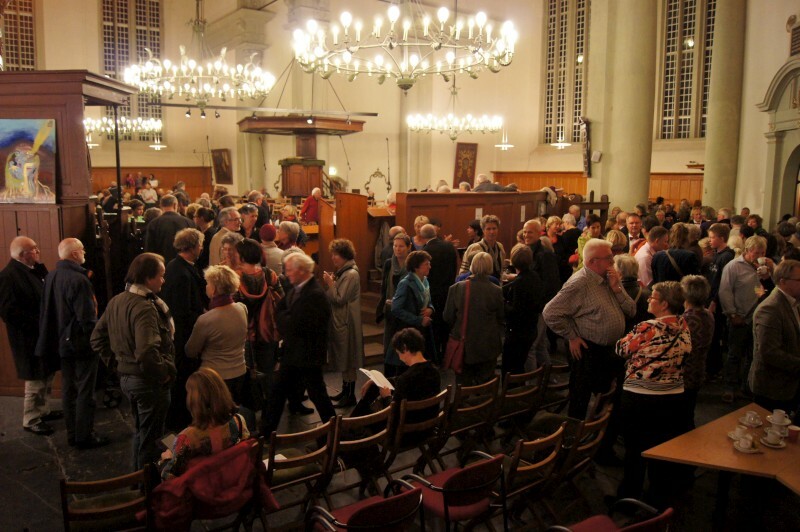 Amusingly, we entered at the front, and the choir was milling around with us at our entrance as we took our seats. I expect this is not a hall with lots of rehearsal space or backstage area. The box is what you get but the experience and the music are what matters. And this was a great experience, with a very satisfying work and wonderful performance that dripped with sentiment. Maybe it’s the work or maybe the performance, but this was not a requiem of despair. 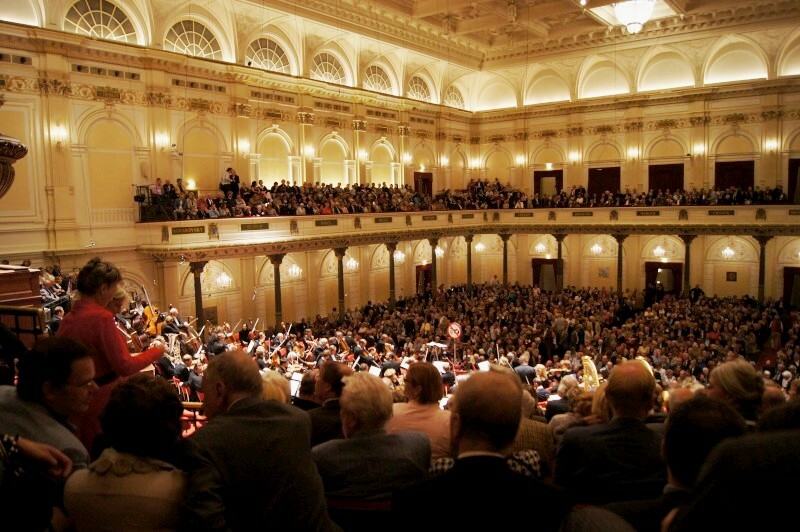 But none-the-less, I’ll treasure the memory of this night at the Concertgebouw. 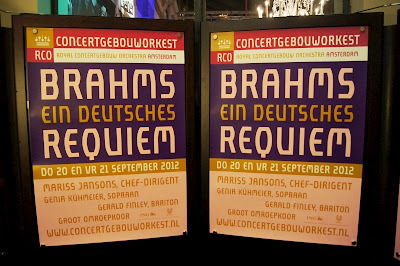 The Brahms German Requiem was performed by the Koninklijk Concertgebouworkest (orchestra) and Groot Omroepkoor (choir) with Mariss Jansons (conductor), Genia Kühmeier (soprano) and Gerald Finley (bass).